Tunnelling - Crossrail . For information about the Elizabeth line please visit the Transport for London website. Building a new railway, up to 40 metres deep through the heart of the capital, is an incredible engineering achievement. The tunnels weave their way through the city’s underground landscape, within touching distance of existing railways as well as beneath some of the most historic buildings in London. 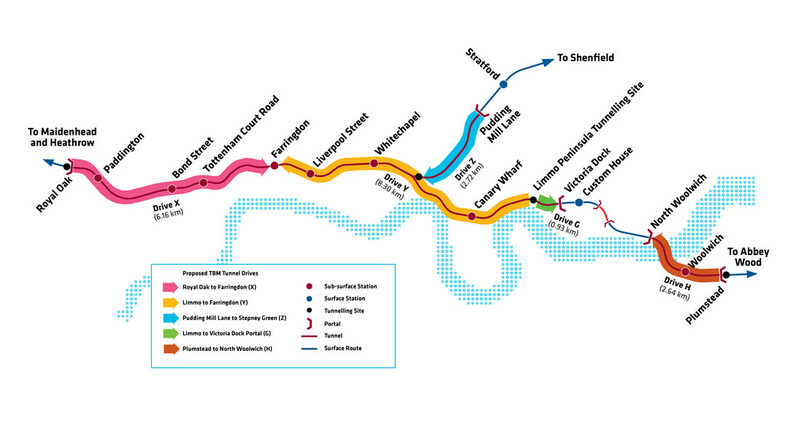 Building the new rail tunnels was a key part of Crossrail’s story. Crossrail tunnelling began in May 2012 and ended at Farringdon in May 2015 with the arrival of tunnelling machine Victoria. For three years, eight 1,000 tonne tunnelling machines have bored 42km or 26 miles of new 6.2 metres diameter rail tunnels under London. Explore how some of the deepest, largest and longest tunnels were made in the most extensive underground building project in a generation. Explore Crossrail’s construction in stunning 360 degree panoramic imagery.